Have you seen these crazy Inflate-A-Mals toys? If you know a unicorn-mad kid we have found a brilliant bargain for you, as Argos have this Inflatable Plush Unicorn Ride-On for just £12.99! It started out at £29.99 when it first went on sale, then dropped to £22.99, and now it's in the Argos Toy Sale at it's lowest price yet. 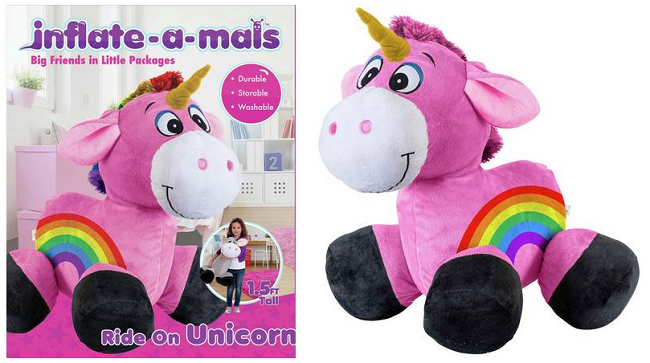 This is a giant plush toy unicorn that has an inflatable middle so that it can be blown up in minutes ready to play with. It takes up way less room that a regular giant soft toy, as it can be deflated and folded down flat for storage, and can even be put in the washing machine if they get grubby. At the moment stock levels are very good, both for free reserve and collect and also for home delivery, though as this is a sale item it's bound to sell fast. guess what’s coming to your house in Feb! Plus I want a go but don’t want it in my house! Do they do adult size? !